Every year I make two charosets for our Seders: the family favorite (a Persian style with pistachios, dried fruit and a hint of cayenne), and also a new one. Last year the newbie was this Dried Fig and Coconut charoset. It was a BIG HIT! It’s easy to make, you can make it ahead and it is NUT FREE. Combine the figs, apricots and cherries in a bowl. Peel the orange and remove the outer white pith (leaving only the orange flesh). Cut the flesh into small pieces and add to the bowl. Add the coconut, ginger, cinnamon apricot jam and wine and mix ingredients. Let rest for at least one hour (preferably several hours) before serving. May be made a day ahead. Almost everyone I know makes brisket for the first Seder. But my grandma, and then my mother — for all the years that I remember — served turkey. So, so do I.
I may also make a brisket, depending on how many people are coming to celebrate with us. Or, I may make brisket for the second night. Depends. But there’s always a turkey. And that means stuffing. 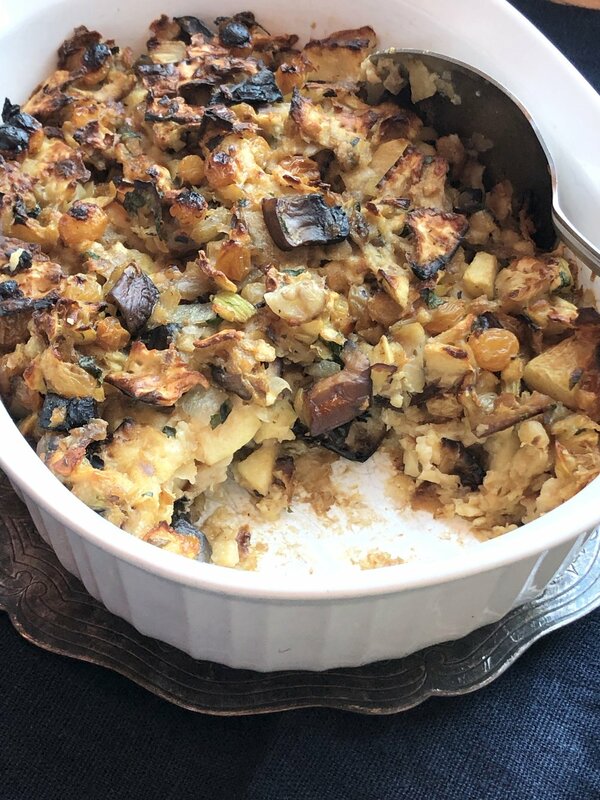 And so, the chosen stuffing for this year: crushed matzo with apples and portobello mushrooms. It’s easy and can be prepared in advance; just pop it in the oven to cook about 40 minutes before serving time. Sometimes I add thyme to this dish, sometimes I don’t, depending on the crowd. It’s delicious either way, although of course, the fresh herb gives it a bit more flavor. Preheat the oven to 375 degrees. Place the matzot in a bowl and pour the stock over them. Let soak for 5-6 minutes or until liquid has been absorbed. Set aside. While the matzot are soaking, heat the vegetable oil in a saute pan over medium heat. Add the onion and celery and cook for 1-2 minutes. Add the mushrooms and cook for 3-4 minutes. Add the apples, raisins, parsley and thyme, if used, and cook for another minute. Spoon the contents of the pan into the bowl with the matzot. Sprinkle with salt and pepper. Toss ingredients to distribute them evenly. Add the eggs, mix the ingredients thoroughly. Spoon the ingredients into a baking dish. Bake for about 40 minutes or until the top is crispy. I recently read Mark Twain’s novel “The Tragedy of Puddin’head Wilson,” a story about what happens after two babies are switched and their real identities are lost almost forever. In addition to being a good read, filled with humor and irony, this book also includes a character who keeps a diary where he writes wise sayings. I always wondered where this famous Twain quote came from: “Cauliflower is nothing but cabbage with a college education.” Now I know. I recommend the book. Also recommend this cauliflower dish, which is so easy to prepare you don’t need a college eduction to make it. Preheat the oven to 425 degrees. Mix the Panko, garlic and dill together and set aside. In a large bowl, mix the olive oil and mustard together until thoroughly blended. Place the cauliflower in the mustard-oil bowl and toss to coat the pieces on all sides. Place the coated pieces on a baking sheet. Scatter the Panko over the pieces and toss to coat the pieces lightly. Roast for about 15 minutes or until crispy and tender, turning the pieces once or twice. Most of the crumbs will separate from the cauliflower. Place the cauliflower in a serving dish, scatter the crumbs on top. We never eat out on Valentine’s Day. Restaurants are too crowded, the service is usually awful and the food not worth leaving the comforts of home. Besides, there’s always the next day. My taste buds don’t know and don’t care if it’s February 14th or 15th. Valentine’s Day is an “extra” that, for us, doesn’t need the same kind of clock-like precision of Rosh Hashanah or Passover. But I do always make a lovely dinner and serve on lovely plates with lovely utensils. Ed would prefer Chinese food, but that’s too much of a fuss for the evening. So: rack of lamb. It’s easy. Simple. No fuss at all. An indulgence, but we deserve it, don’t we? Preheat the oven to 450 degrees. Place the meat in a roasting pan. Mix the mustard and preserves and spread on the top surface. Sprinkle with salt, pepper and rosemary. Roast for 20-35 minutes, depending on degree of doneness desired (a meat thermometer should register between 120-140 degrees). Let the meat rest a few minutes before carving. Kosher Baked Beans and "Bacon"
And yesterday there was a snow squall. Cold, snowy and blowy with no visibility for about a half hour. I can’t complain though. It’s MUCH colder in the midwest. Also my house is nice and warm and toasty. And I have these baked beans for dinner. Real, authentic Boston baked beans with bacon. Ok, kosher bacon. There are many brands to choose from, but I used Abeles & Heymann’s newish chunk beef bacon because Seth Leavitt, A&H owner, gave me a piece of it a while ago. He said “go experiment.” Which I did. And out came these fabulous beans. Dinner. Add a green vegetable. Just like in Colonial times (minus the green vegetable). 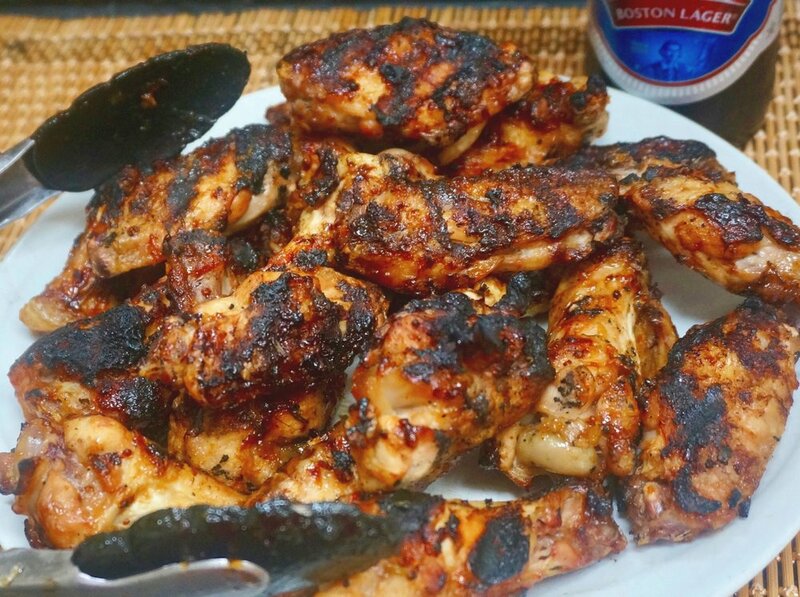 Btw, this is a good dish for Superbowl parties — by itself, but it’s also a nice accompaniment to chicken wings. Place the beans in a large saucepan and cover them with water. Bring the water to a boil over high heat. Lower the heat and cook for 2 minutes. Remove the pan from the heat and let the beans soak for one hour. Drain the beans and return them to the pot. Cover the beans again with water and bring to a boil over high heat. Lower the heat and simmer for 45 minutes. (Alternatively, cover the beans with water and let them soak for at least 8 hours.) Drain. Place the beans in a casserole. Add the bacon, onion, ketchup, honey, molasses, cloves, mustard and salt and mix thoroughly to blend the ingredients. Stir in 3 cups water. Pour the mixture over the bean mixture. Cover the casserole and put it in the oven. Set the temperature at 300 degrees and cook the beans at least 4 hours, or until they are tender, stirring them occasionally and adding water, if necessary to keep the beans moist. Once again I was loaded down with bananas. We had sleepover guests for New Year’s weekend and I bought a lot of fruit. Too many bananas as it turns out. Which is fine, because I love baking new versions of banana bread. If you read my blog you know I hate to waste food. So for me, this particular recipe is really good because it’s a three-fer. Not only did I get to use up the bananas, I also was able to use fresh orange peel from some of the fruit I squeezed for juice. And I used up the date sugar I had in my cabinet (although this recipe is also fine with brown or white sugar as well). 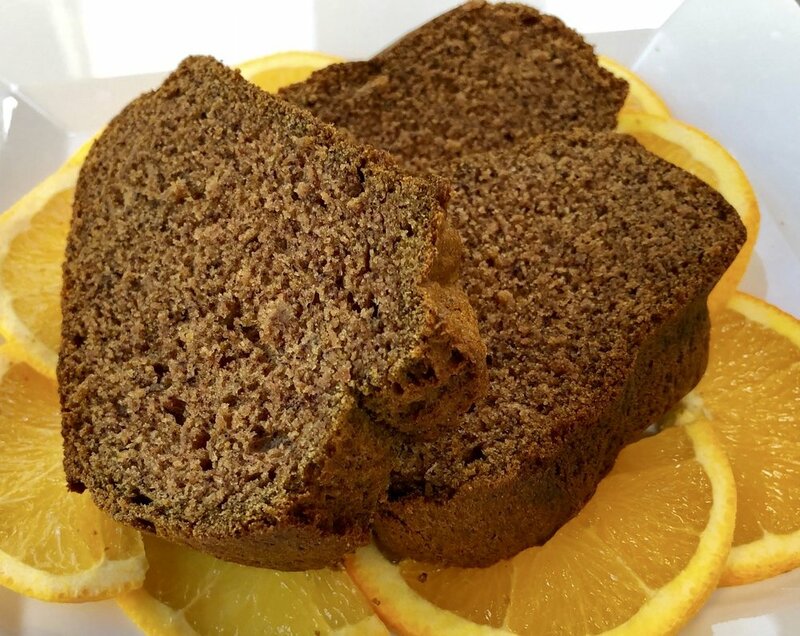 The added citrus peel gives this bread a perky citrus taste. A refreshing thing, much needed in the gloom of January. Because it isn’t very sweet, this is also especially good as a breakfast or brunch bread. You can use it to make cream cheese sandwiches too. Preheat the oven to 350 degrees. Grease and flour a 10-cup bundt pan. Mix the flour, orange peel, baking soda and salt in a bowl. In the bowl of an electric mixer set at medium speed, beat the shortening and date sugar until well blended. Add the bananas and beat them in thoroughly. Add the eggs and vanilla extract and beat them in thoroughly. Add the flour mixture and beat for a minute or so until the batter is well blended. Pour the batter into the prepared pan and bake for about one hour or until a cake tester inserted into the center comes out clean. Remove from the oven and let cool in the pan for 15 minutes. Remove to a cake rack to cool completely. Every New Year’s Eve my brother and sister-in-law come over for the day, my cousins sleep over for a couple of days. We start our celebration early with a round of drinks and hors d’oeuvre. A few hours later we have another round of drinks and hors d’oeuvre. We have dessert much later, near midnight. The anticipation of something sweet helps keep us up so we can watch the ball drop and then go to bed. Some of the hors d’oeuvre I serve are fancy, some plain; some homemade, some from a package (like the Spring Valley or Hebrew National franks-in-blankets that everyone loves). A while ago I read a blog post about Beet tarte tatins and was inspired to make some because they looked and sounded so appealing. I made up my own recipe, tried it a few times and decided that they would be perfect as one of the fancies at this year’s New Year get-together. I wrote down whose blog it was, so I could credit her with the inspiration, but I can’t find the paper and forgot the name. But — to that wonderfully creative person who alerted me to beet tarte tatin —- thank you. Preheat the oven to 350 degrees. Use a small amount of the olive oil to brush the insides of 6 muffin tins. Peel the beet and cut it into thin slices, then cut the slice to make them small enough to fit inside the muffin tins. Place the cut beet slices in a bowl. Add the shallots and toss the ingredients. In another small bowl, whisk together the remaining olive oil, Mirin and brown sugar and pour the dressing over the beet mixture. Sprinkle with the rosemary and salt and spoon equal amounts of the beet mixture inside the muffin tins. Cover the filled tins with aluminum foil and bake for 30 minutes. Remove the tin from the oven. Raise the oven heat to 400 degrees. Cut out 6 circles from the puff pastry to cover the top of the muffin tins. Place over the beets. Bake for another 20 minutes or until the pastry is puffed and golden brown. Carefully spoon each beet mixture from the bottom and turn it over onto a dish so that the pastry is at the bottom. Spoon any remaining beets that do not come up and place them on the tarte tatins. Garnish with the orange peel and serve (may be served hot or at room temperature). For me, the appeal of winter foods is their ability make me feel warm and well-nourished. I don’t expect them to be gorgeous. 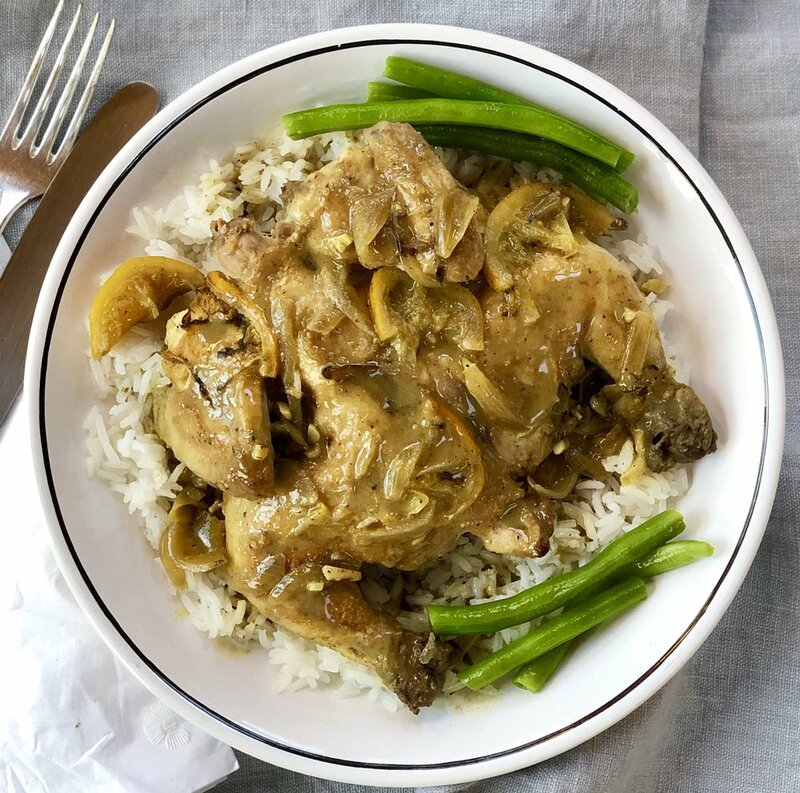 When I look at dishes such as beef stew or a beloved chicken-and-soup, I don’t see art, I see safety and memory and the expectation of comfort. This is why, when winter comes, I look for side dishes or desserts or an appetizer that can provide some color or add some beauty to the entree or the meal. This barley casserole fits the bill. It’s a substantial side dish that works with meat, fish and poultry, with stews and hearty winter casseroles and for vegetarian meals too. It’s colorful and makes for an attractive addition to a winter dinner. Heat the olive oil in a sauté pan over medium heat. Add the carrots and scallions and cook for about 2 minutes. Add the barley and cook for another 2 minutes, stirring often. Pour in the stock and add the salt, pepper and thyme. Stir, bring to a boil, lower the heat, cover the pan and simmer for about 50 minutes or until all the liquid has been absorbed. Stir in the raisins and almonds and toss gently to distribute the ingredients evenly. Cover the pan and let rest for 5 minutes. Spoon into a serving bowl and sprinkle with parsley.